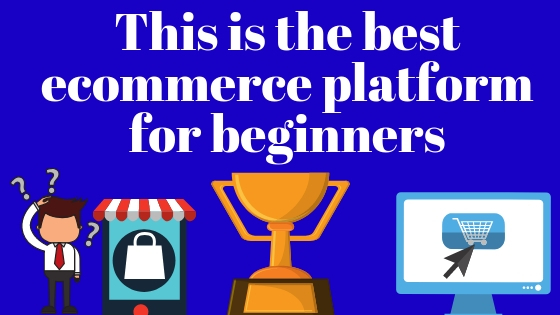 In this article I will share my opinion about what is the best ecommerce platform for beginners in 2019. The answer to the question is based on two factors: my own experience of building an ecommerce store in 2018 and a wider picture of what type of e-commerce platform / platform company I would recommend for those who are just getting started with ecommerce. Even though my own experiences are from last year, I feel that they are still very relevant for the sake of this article. In my opinion Shopify is right now the best platform for building your own store, if you don’t have lot of experience with ecommerce (especially from the seller side). From my personal experience I can tell that I was able to build a decent store in about couple hours, even though priory to starting to create the store I had very limited experience with doing anything of that sort. Something that was very important for me with Shopify, was that no coding skills or experience was needed for building the store. Building the store was basically just about putting things into the places you wanted them in, writing things such as product descriptions and names for different categories and choosing the settings you wanted for your store. Very quick and easy. After trying Shopify, I have looked through more of their competitors and none of them seem as easy as Shopify. Open your Shopify store now. Even though I can recommend Shopify based on my own experience, there are also other factors that strongly support choosing Shopify for your store – especially if you don’t have lot of experience with selling online. Maybe the biggest one is their very good and helpful customer service. If you are like me, it is not once or twice that the customer service of some company has really frustrated you. With Shopify the support was very helpful and easy to reach (good live chat on the website, in addition to the other options). Having interacted with the support, I felt like they really wanted to help me to succeed in selling online and were able to explain things in clear manner. The second thing is the trust factor. Shopify is a huge, stock-exchange listed company and as such you should be able to trust it. This is something that is especially important for beginners, because as a beginner it would sometimes otherwise be difficult to spot the ‘red flags’ that indicate a company is not a good choice for building your store. Two-week free trial. When you don’t have lot of or any experience with building an online store, it is natural that one might be very hesitant to start paying for the e-commerce platform straight from the start, without be able to try the platform for free at first. Luckily, Shopify currently offers a 14-day free trial – given how quick and easy it is to build your store with their platform, that should be plenty of time to decide if you want to become a paying customer of the company. However, even if you decide to become a paying customer, it is good to note that you are not forced to sign up for a long-term commitment. Instead you can choose to use the platform on monthly basis, which might be useful because as a beginner it might be difficult to estimate the demand for your products. The cheapest monthly plan for building a stand-alone store at Shopify costs just $29 month. Although, it is good to note that if you feel like you are ready to commit for the long-term for trying to make your ecommerce store successful, there is 10% discount on the plans if you pay for one full year in advance and the discount goes up to 20%, if you pay for full 2 years in advance. To sum it up: I think that Shopify is the best choice for people who are looking to get into ecommerce. Thanks to their integration with Oberlo, Shopify is also a great choice for those who are interested in getting started with dropshipping as beginners. Open your Shopify account now.